This week, I worked on two videos currently playing on the nytimes.com website. The first is about a City Harvest program that reimburses farmers for the cost of picking and preparing fresh produce, so they can provide it to needy families in New York City. The second, is a demonstration of one method to get the most meat off the turkey at Thanksgiving dinner. Ray Venezia, the director of the meat department at New York’s Fairway markets, offers his expert advice for our cameras. His key point: don’t try to carve the turkey at the table. Cut the meat off in large pieces first, then slice them, and arrange the slices on a serving tray. But Ray says it — and shows it — much better. Read Julia Moskin’s story about Ray in the Times’s Dining section here. And, while editing the turkey carving piece, it occurred to me that the traditional Thanksgiving song “We Gather Together” is the same tune as “you can tell by my outfit that I am a cowboy,” a parody song my dad used to sing. So on a flight today, I realized that the “cowboy outfit” melody is really the tune of “Streets of Laredo,” but that song sounds remarkably similar to We Gather Together. Maybe it’s a Love Me Tender is really Aura Lee thing. Or how Barry Manilow’s “Could it Be Magic,” is a Chopin Etude. “And if you get an outfit you can be a cowboy too!” I watched the Turkey carver video and maybe I’ll try that the next opertunity. Although some people like to make soup from the carcase and so they don’t worry about how much is left on the bones. Seems we always over cooked the bird so the meat didn’t stick to the bones, it kind of fell off. Interesting that the Times would have you do such an article –Very practicle and your usual good job. Hi, This carving video is absolutely excellent. Brilliant explained and I followed it last year and everyone was really impressed. I have sent the link to all my friends (I’m English and live in London). 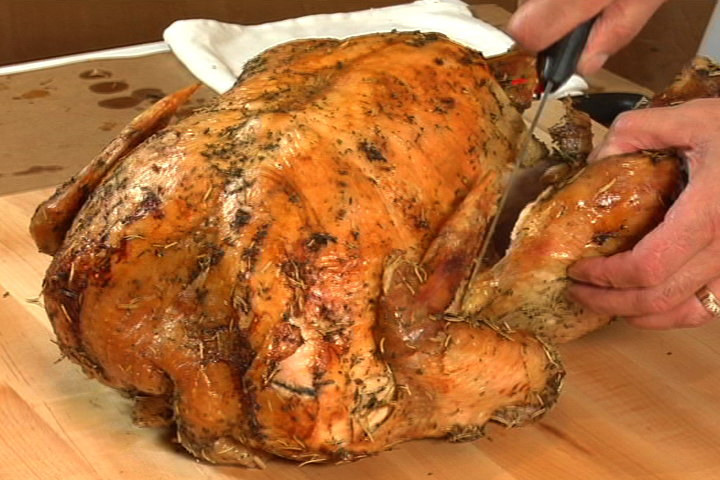 I have honestly never seen a turkey that looks as moist and melt-in-the-mouth as the one in the video does and since I first saw it over a year ago I’ve been trying to find the recipe they used. Does it exist ? Hi Jasmine, sorry, I don’t have the recipe. Ray Venezia, the Fairway butcher, had two birds cooked and prepped before I got there.